Life 120 is hands down the most powerful, complete full spectrum multi-mineral, multi-vitamin, and daily whole food complex supplement in the world! All this power in an easy-to-take tablet form. Nutrition is what builds every part of you, every cell, every organ, the blood in your body, and every metabolic chemical in your body, all comes from the quality of nutrition you receive. Nutrition is what you are literally made of. There are 103 nutrients that your body must have in order to have longevity. The body was meant to live to 120 years of age, and the foundation to do so is based on your body receiving proper nutrition. The problem with this, is that the foods that we are getting from most grocery stores are depleted of proper nutrition. Our soils are depleted of essential minerals. Our air is polluted. Our water is polluted. Our bodies are being bombarded by toxins and oxidants like never before. No wonder people are dying on average globally at the age of 71. Our belief is that people, as a whole, are dying much earlier than they should, and most of it is from the lack of knowledge. We are here to change that, and our most potent product we have to do that is Life 120. 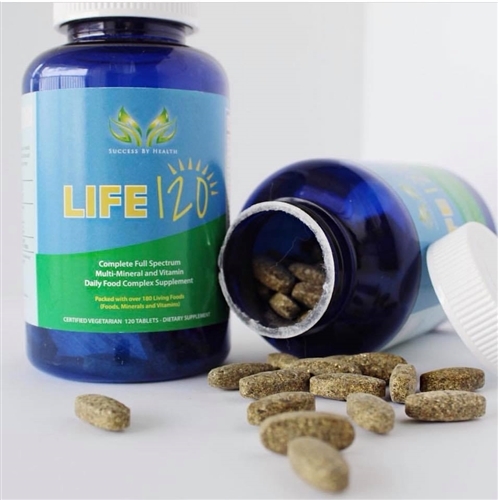 Life 120 is packed with over 180 all natural Living Foods, including whole foods, minerals, and vitamins. This powerful combination provides your body daily with the specific 72 minerals you need and more, the specific 16 Vitamins you need and more, plus the specific 12 Amino Acids you need and more. 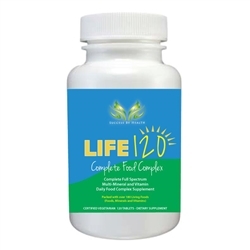 Life 120’s powerhouse mineral blend activates all the dense whole foods and nutrients, to allow for maximum digestion and absorption.